Costa Rica's most wild and untamed region is waiting for you explore by land and sea. Our Corcovado snorkeling tours offer you some of the best opportunities for just that! Make the most of your time in Costa Rica by trying out its sensational snorkeling excursions in Corcovado & Osa Peninsula region. 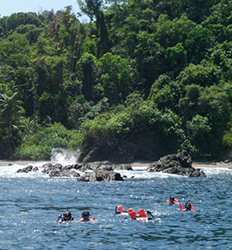 With such a vast area to explore, there are snorkeling tours in Corcovado for every travel style. 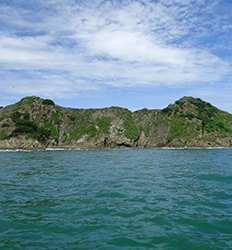 Our top pick for snorkeling in Corcovado is the Caño Island Biological Reserve Snorkel Tour. Located off the coast of the Corcovado National Park, Caño Island is hands down Costa Rica's best snorkeling destination. 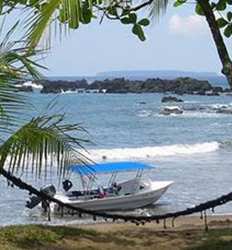 Caño Island is a mysterious and wild island in Costa Rica. It's uninhabited by humans and gifted with utter natural beauty. Prepare for the richest eco tour in Costa Rica, and get ready to see gigantically beautiful marine creatures, like White Tip Reef Shark, graceful sea rays, goofy puffer fish, and perhaps even sea turtles! The Corcovado Hike and Caño Island Snorkel Super Combo is another trip to conquer. You don't have to choose between a snorkeling and a hiking tour as this package generously gives you both. Explore the most biologically intense place on Earth: Corcovado National Park, and enjoy the best snorkeling in Costa Rica in one perfect eco-tour! To the north of Corcovado you will find the Marino Ballena National Park where you can choose from our Marino Ballena Snorkel Express Tour or get the most interaction with the regions marine life on the Marino Ballena Whale Watching & Wild Dolphin Combo Tour. Here you will behold the beautiful Costa Rican coral reefs, colorful tropical fishes, huge yet gentle whales, and the 5 scenic beaches that make up Marino Ballena National Park. So get ready as you snorkel your way towards the wonders of the marine richness of Corcovado & Osa Peninsula with Real Deal Tours. With something for the whole family, our budget friendly Corcovado snorkeling tours will surely help you achieve your dream vacation in Costa Rica. Our super combo tour combines a guided hike to Cocovado National Park with Snorkeling at Caño Island for the most nature intensive eco tour in Costa Rica! For nature lovers, Corcovado National Park is a must-see when visiting Costa Rica and since Caño Island is just off the coast, you get the best of both land and sea! 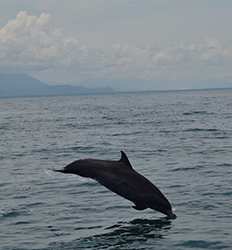 Corcovado Hike and Caño Island Snorkel Super Combo deposit is $30.00 per adult and $15.00 per child.